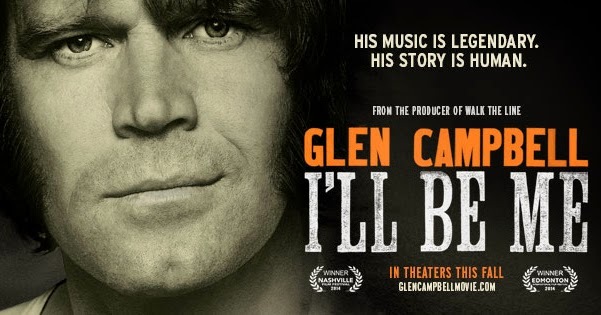 RETRO KIMMER'S BLOG: GLEN CAMPBELL MOVIE I'LL BE ME IN THEATERS OCTOBER 24!! GLEN CAMPBELL MOVIE I'LL BE ME IN THEATERS OCTOBER 24!! IN THEATERS OCTOBER 24th 2014: GLEN CAMPBELL I’ll BE ME tells the story of music legend Glen Campbell. His life, his music and the extraordinary 151-city "Goodbye Tour" de force that's made him a hero. The film features those who know and love Glen, including Bruce Springsteen, Bill Clinton, The Edge, Paul McCartney, Jay Leno, Vince Gill, Jimmy Webb, Blake Shelton, Sheryl Crow, Keith Urban, Brad Paisley, Steve Martin, Chad Smith and Taylor Swift among many others. This powerful portrait of the life and career of great American music icon Glen Campbell opens us to the world of the singular talent who created hits like Rhinestone Cowboy, Wichita Lineman and Gentle on My Mind. Winner of the Grammy for Lifetime Achievement and member of the Country Music Hall of Fame, Glen was the first country music star to cross over to the pop charts, opening a new realm of opportunity for generations of country musicians.